Necrotizing enterocolitis (NEC) is a serious inflammatory disease that primarily affects premature infants and is characterized by immune cell infiltration into the intestinal mucosa, disruption of the intestinal barrier, and a high incidence of systemic sepsis. Therapeutic options for NEC are limited and the drivers of NEC pathogenesis are incompletely understood. Charlotte Egan and colleagues at the Children’s Hospital of Pittsburgh evaluated the immune cell population in the intestines newborn infants and mice with or without NEC and determined that NEC development is associated with a lymphocyte-rich infiltrate that is characterized by an induction of Th17 cells and a reduction of regulatory T cells (Tregs). The presence of lymphocytes was required for the development of NEC, as Rag-/- mice were protected from NEC development; however, adoptive transfer of naïve CD4+ T cells into these mice prior to NEC induction restored NEC susceptibility. TLR4 is elevated in the intestines of premature infants and mice, and animals lacking TLR4 in the intestinal epithelium are protected from NEC. The authors determined that TLR4-dependent release of CCL25 mediates lymphocyte recruitment to the gut. Moreover, persistent TLR4 signaling skewed the tolerogenic Treg population toward an injurious Th17 subset via STAT3-dependent polarization. Th17 cells were required for NEC development, as targeting STAT3 or IL-17 signaling reduced NEC development in mice. Additionally, enteral administration of retinoic acid reversed Th17 polarization, elevated Tregs, and reduced NEC severity. Together, these results provide important insight into the drivers of NEC and suggest retinoic acid be further explored as a potential treatment for NEC. The accompanying confocal micrograph shows the terminal ileum of a Rag-/- animal that had been reconstituted with donor CD4+ T cells prior to induction of NEC. 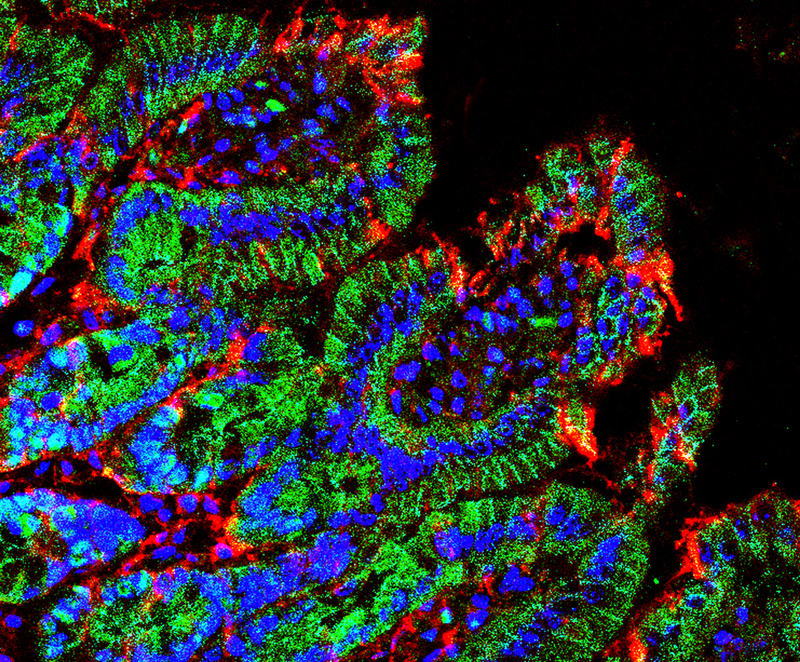 Note the damage (mucosal 3-nitrotyrosine, red) to the intestinal epithelium (E-cadherin, green), which is characteristic of NEC. Nuclei stained blue with DAPI. Citation Information: J Clin Invest. 2016;126(2):495-508. https://doi.org/10.1172/JCI83356. The nature and role of the intestinal leukocytes in necrotizing enterocolitis (NEC), a severe disease affecting premature infants, remain unknown. We now show that the intestine in mouse and human NEC is rich in lymphocytes that are required for NEC development, as recombination activating gene 1–deficient (Rag1–/–) mice were protected from NEC and transfer of intestinal lymphocytes from NEC mice into naive mice induced intestinal inflammation. The intestinal expression of the lipopolysaccharide receptor TLR4, which is higher in the premature compared with full-term human and mouse intestine, is required for lymphocyte influx through TLR4-mediated upregulation of CCR9/CCL25 signaling. TLR4 also mediates a STAT3-dependent polarization toward increased proinflammatory CD3+CD4+IL-17+ and reduced tolerogenic Foxp3+ Treg lymphocytes (Tregs). Th17 lymphocytes were required for NEC development, as inhibition of STAT3 or IL-17 receptor signaling attenuated NEC in mice, while IL-17 release impaired enterocyte tight junctions, increased enterocyte apoptosis, and reduced enterocyte proliferation, leading to NEC. Importantly, TLR4-dependent Th17 polarization could be reversed by the enteral administration of retinoic acid, which induced Tregs and decreased NEC severity. These findings identify an important role for proinflammatory lymphocytes in NEC development via intestinal epithelial TLR4 that could be reversed through dietary modification.